Mark Saviers is an old friend of Bo’s as they both attended Southside High School in Fort Smith, Ar., and are Phi Delta Theta Fraternity brothers from the University of Arkansas. Oddly enough yesterday was the first time these two old friends had an opportunity to go fly fishing together. 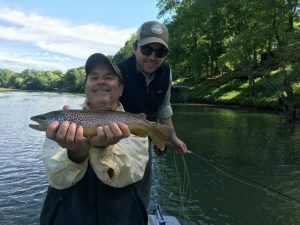 Mark and his son, Marshall, are both accomplished fly fishers which was a good thing as the water on the Little Red River was low and very dirty requiring some very good drifts in just the right places for success. 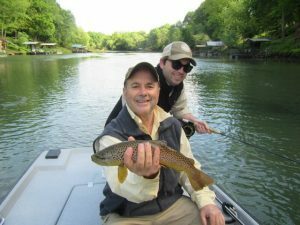 Mark put on a clinic nailing one Brown Trout after another so Bo finally had to make him move to the back of the boat so Marshall could have first shot at new water. It was a really fun day with a bunch of nice fish. 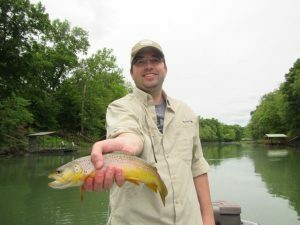 By the way, Bo and Mark both serve on the Board of Directors of The Little Red River Foundation which is a tax exempt organization dedicated to improving water quality and fishing on the Little Red River. If you are not a member please go the website: www.lrrf.org. and consider becoming a new member. 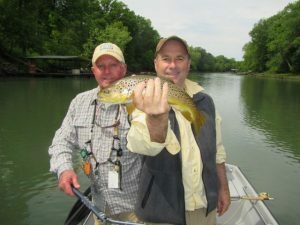 Let’s keep our river among the top trout streams in the nation so old friends and their sons can continue to enjoy world class trout fishing on The Little Red River!